Recently I've been loving the dewy fresh-faced look. The majority of the products I used to use in my makeup routine left a matte effect on my skin so I've had to change up my makeup routine a little bit. 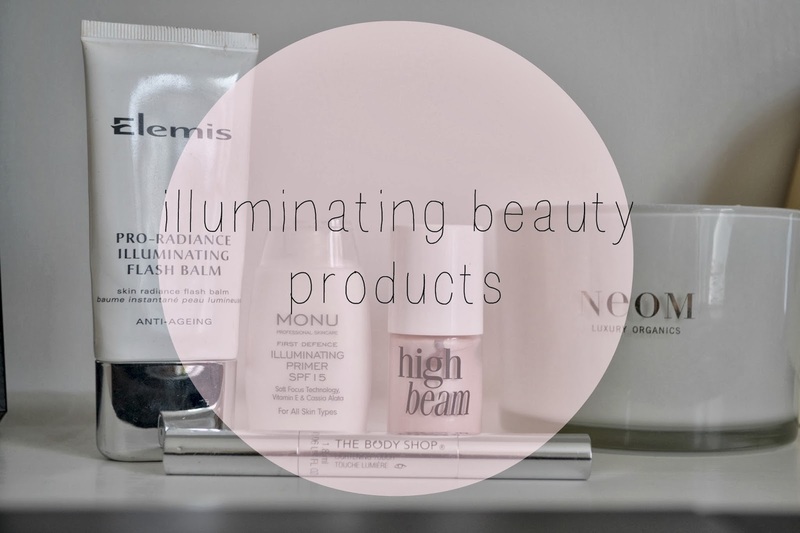 Therefore, I've introduced a combination of products that give me the desired glow and illumination I've been looking for. The first product that I've been using for a while now is the Elemis pro radiance illuminating flash balm. I've blogged about this product before, it's a lovely cream that brightens the skin leaving it radiant and glowing. On make up free days I apply this to my skin just by itself as it makes the skin look and feels healthy. Once I've applied the flash balm I like to use a primer, I'm currently trying out this illuminating primer by Monu which I'm still trying to figure out if I like or not but it definitely does what it says on the bottle. Sometimes when I apply a little too much of this stuff I feel like Edward Cullen in Twilight when his skin catches the sun and sparkles (cringe twilight reference but it's true) My issue with this primer is its very thick and feels like when you apply sun cream and you have to rub it in loads. However, used sparsely it is a really nice primer and leaves the skin very bright. Then after I've applied my foundation I use the two other products which are Benefit's High Beam and The Body Shop's lightening touch. Both of these products I use to highlight the skin. Lightening touch doubles up really well as a concealer for under the eyes. I like to add a high beam on my cheekbones to make them stand out and add reflection. That elemis balm sounds lovely!